Love the dude. 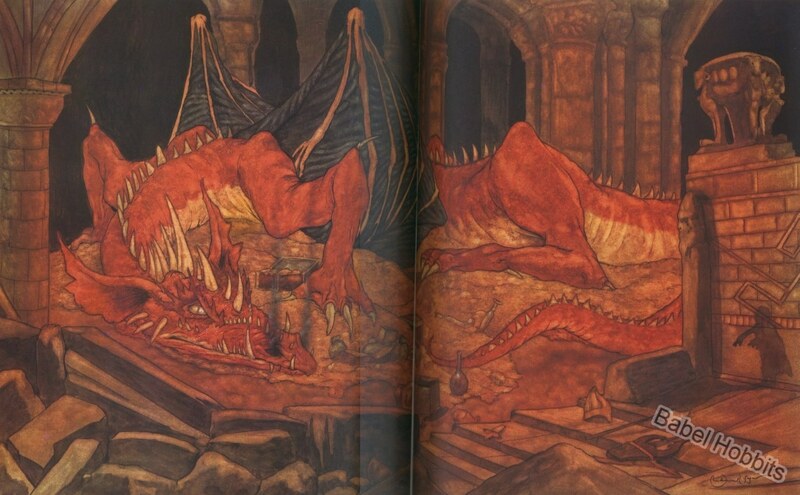 This is the Smaug of my childhood, and I confess fully to possessing no objectivity whatsoever regarding him. What do you guys feel about him, as more ardent fans of the source material? He's better than the Benedict Cumberbach Smaug, because he's pretty much just... Smaug, for lack of a better term. Rankin-Bass managed to make the scene nearly word-for-word from what's in the book, but made it work and made it grand. He has screen presence and a confidence and bravado that surpasses the live action one, for sure. I think its because Rankin-Bass just let the fact he's freaking fully cognitive DRAGON speak for itself. It's a unique look, but I remember not liking it as a kid because of how different he looks from the artwork in the version of the book I had. I can appreciate the unique look more now. This is the version of The Hobbit my father first read to me. Then he showed me the movie. It was pretty cool to see everything "come to life," so I never questioned the aesthetic of any of it. But I could see how he would be -- well, weird, conceptually if you were expecting something else. He looks badass. Definitely more in line with the classic "dragon" image. I can see why you were underwhelmed by animated Smaug. Well, I also didn't actually see the cartoon until I was like 13. I grew up during that period in the 80s where the only way to have seen it was to have watched it on TV. I had read the book several times by then. I just remember visiting my cousins and they had it taped so I checked it out. But I don't have the childhood nostalgia for seeing it as a youngster like you. My kid brother saw all the animated versions growing up because they were all available by then. He has a greater fondness for them than I do, that's for sure. My parents taped it off television. We had a grainy, awesome copy -- on Betamax. That's pretty much how I first saw everything from early childhood for the first time. The feline look really comes from the fact Rankin-Bass' Smaug has characteristics of both Western and Eastern style dragons. It's my favorite version of Smaug. Benedict Cumberbatch wasn't bad (excepting the movie's "jump the shark" moment where he was chasing the Dwarves for a full twenty minutes), but the animated Smaug was a lot more confident and cooler. And in that version, he didn't stand around talking to Bard while he was attempting to shoot him. In the animated version, Bard pretty much had only seconds to spare, and he managed. This. Somewhere between filming the old LotR trilogy and now, Jackson forgot the value of brevity. Making three 3-hour films to adapt The Lord of the Rings was necessary, but not for The Hobbit. The fact that he had to start padding things out with the script they went with was obvious. Here's that thing, padding the script wasn't even necessary. He still cut parts of the book to make way for a lot of stupid crap. Very, very true. I'd already mentioned that to just about everyone here on the Middle-earth section, and didn't want to get repetitive in going over the issues with the Hobbit film trilogy. Yeah, what they did to Beorn is unforgivable. There was a Hobbit game by Sierra around the same time as the LotR film trilogy. While it had glitched, wonky controls and levels, it did an excellent job of telling the story and did a much better job hinting at the larger scale things than Jackson did. Example: in the level where the dwarves are held captive by the elves, you can overhear the elves wandering around their stronghold talking about the Necromancer and his invasion on their territory, but at no point does the game take the story away from Bilbo to go off with the White Council. Those short exchanges where I was starting a short distance away as Bilbo wearing the Ring were so much more powerful than all the Necromancer crap they poured into the films. That video game was my introduction to Tolkien's works. It still holds a special place in my heart. My brother actually speedruns that game now. It also holds a special place in my heart as well due to how well it told the story, and also because of the excellent voice acting (Michael Gough as Balin for instance).